Will The Real 99% Please Stand Up? 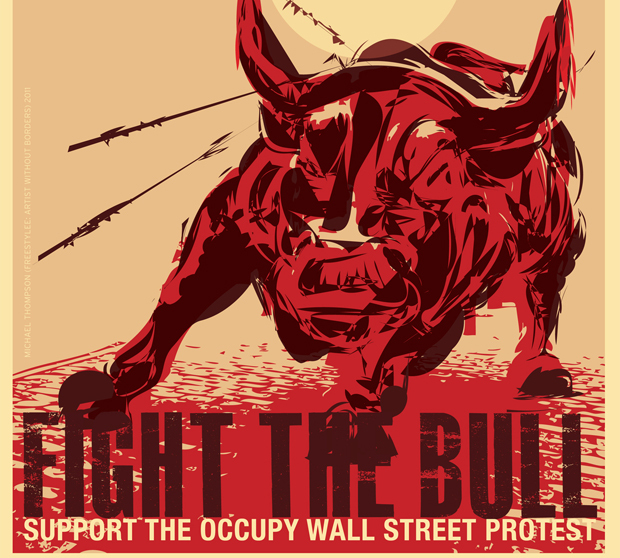 Occupy Wall Street is meant to be a leaderless movement. But that hasn’t stopped some people from trying to identify leaders. And some activists charge that organizations are trying to co-opt their message. How can a phenomenon with no central authority exercise authority over its brand? Over the past two weeks, a group of Occupy Wall Street supporters called “We Will NOT Be Co-Opted” has been working on a statement to declare its independence from any group or political organization. Nothing’s been approved yet, but some form of the first sentence from the draft will likely make it through: “The Democratic and Republican parties do not represent the people because they’ve been bought and corrupted by Wall Street, and the occupation does not support their candidates.” The statement probably won’t name names. But activist journalist Dave DeGraw, one of the members, confirmed that it was prompted by fears of MoveOn.org trying to become the mouthpiece of the movement, and in the process co-opt OWS under the Democratic Party. 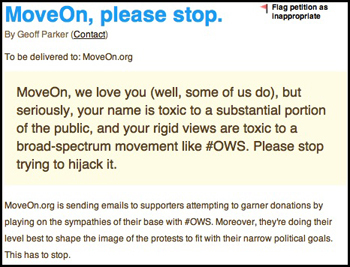 A bit more explicit is an online petition called “MoveOn, please stop,” created by someone named Geoff Parker using MoveOn’s own petition-generating platform. It’s a tricky matter, though, because MoveOn is also an important supporter. Many activists appreciated its national petition that collected 300,000 signatures to oppose the cleaning of/possible eviction from Zuccotti Park on October 14. “We have never tried to speak for Occupy Wall Street. We have never claimed to,” said Justin Ruben, the executive director of MoveOn.org. The group posted a clarifying message on its website, too. Will this take attention from the occupations already going on in hundreds of cities? In dealing with Occupy Wall Street–whether as a journalist, a politician or just an onlooker–it’s tempting to look to an organization such as MoveOn, because, well, it is an organization. It has a Web site, defined goals, executives and publicists. Occupy Wall Street, by definition, has none of that. Occupy Wall Street claims to be inspired by the Arab Spring, but can it, too, convert social media outrage into real action? Students are a big contingent at Zuccotti Park and other occupations. But the first ever demographic study shows a range of ages, incomes, and politics. An on-the-ground look at the occupation from day one, with an eye for what made the movement feel different than any other action in recent history. The site occupywallst.org appears to be an official voice. It’s not. Justine O’Tonnaigh had created it before the New York General Assembly had even formed. (She had to go with the “st” abbreviation because Adbusters had already registered occupywallstreet.org back in June.) O’Tonnaigh has earned respect for posting items that represent the consensus view from Zuccotti Park. But that’s up to her. She has no obligation. Similarly the Twitter account @OccupyWallSt is described as “Official twitter of our site!” However, “Opinions tweeted do not reflect the occupation as a whole.” But when the owners discovered @occupywailstreet (substituting the letter “i” for the first “l”), they asked Twitter to shut down the account, and it did. On October 6, occupywallst.org ran a disclaimer disavowing a site called occupyparty.org. “This Site Has Nothing To Do With Us,” read the headline. The site is plastered with stock photos of people waving flags, the phrase “99 percent” and rolling updates about Occupy Wall Street news. Especially grating was the phrase “We are the Tea Party of the Left.” The terse post stated simply “We are not a political institution.” In fact, participants in the movement generally loathe all political parties. And contrary to stereotype, some members do not identify as left. It’s hard to tell what occupyparty.org is. The site has no contact information. Emails sent to various combinations of letters before “@occupyparty.org” bounce back. A Whois lookup indicates that it belongs to someone in Australia. The blog post spawned 570 comments speculating what it could be. Many feared a right-wing plot. Unable by its principles of inclusiveness to say what it is, Occupy Wall Street’s main communication goal is to say what it’s not. “Occupy Wall Street is outside institutions,” said volunteer Bill Dobbs. “The challenge is, [organizations] coming in sometimes want to get more than they want to give.” In other words, he fears takeover schemes, especially from the left. “I think that in the long term the Democrats are going to try to co-opt us,” he said. “We are definitely opposed to that.” After all, “we” includes people carrying Ron Paul signs. The group is more limited than an agency working for a control-freak client. In fact, the PR team has to make sure that it has no message, other than an appreciation for diversity. “We try to keep our views and political ideas out of it and emphasize the plurality of the movement,” said Mark Bray, a history PhD candidate from Rutgers and member of the PR team. Also, anyone can join the group, he points out. So when Adam Nelson, owner of boutique PR and branding firm Workhouse Publicity, sent out a message supporting the movement, there was some concern among the activists that Workhouse was trying to become the official PR firm. News headlines didn’t help. “Occupy Wall Street protesters picked up by public relations firm Workhouse pro-bono,” read the New York Daily News. In truth, all he did was send an email on September 28 titled “OCCUPY WALL STREET: News From The Front.” It linked to a Facebook album with photos he had taken in the field of cardboard signs that have become a fixture at Zuccotti Park. “Our friends, particularly on the West Coast, had no idea this was going on, and we broadened the message,” Said Nelson. His roster or friends includes Bianca Jagger, Matthew Modine, Spike Lee, Michael Moore, Buck Henry, and Julian Schnabel. Nelson also collaborates with super producer/activist Russell Simmons, co-founder of Def Jam records, who has been a highly visible OWS supporter. Nelson has sent out additional messages, including one with a graphic defending OWS against the plans to clean and possibly clear Zuccotti Park–essentially his version of what MoveOn did with its petition. His description is similar to how Justin Ruben describes MoveOn’s involvement: as a supporter but not a formal spokesperson. In fact, there is no such person. Some articles have identified Patrick Bruner as the official voice. We were unable to reach Bruner by press time. But in an email to Fast Company, Mark Bray wrote “We do not have an official spokesperson. Patrick has been involved since the start, but what he says carries no more weight that the words of anyone else.” And there is no sign that Bruner has ever claimed a spokesperson role. Besides, the only official information the press can get is logistical: The number of arrests, the amount of money received in donations, where the Wi-Fi comes from. “Occupy Wall Street” isn’t a name, it’s a task. The “organizers”–whoever wants to pitch in–make sure the occupation works logistically–with food, sanitation, shelter, communications. Thus comes the greatest critique of the movement: It has no demands. Even if the power elites wanted to yield to the protesters, what would they do? Of course many topics come up, and they are often quite specific: end corporate personhood, limit corporate financing of political campaigns (by reversing the Supreme court’s ruling in Citizens United), forgive student loan debt, reinstate the 1933 Glass–Steagall Act that separated commercial and investment banks. They are all in the same vein: reining in the power of big money in government and the economy. But any specific demand might have only a narrow constituency. And there is a concern that narrowing the list of demands will narrow the base of support. A movement isn’t a platform. Occupy Wall Street may inspire participants, organizations and even politician to take specific actions. But it may never develop its own specific agenda, despite Web sites like The99PercentDeclaration, posted around October 18 by a few OWS attendees and calling for a national assembly next summer. Despite the Huffington Post headline “Occupy Wall Street Protesters Propose A National Convention, Release Potential Demands,” it does not actually represent the entire movement, and many activists first learned of it from the HuffPo article. But other participants concede that, while such a statement is not “official,” it can’t be censored, either. That seeming inability to produce an official statement makes OWS vulnerable to any person or group trying to slap a mission statement on it. But by vigorously emphasizing plurality and inclusiveness, and frankly by demonstrating a lack of focus, OWS may show how implausible those claims of leadership are.